Nature has lots of things which look random, but which are influenced by environmental factors. For example, when pine cones fall from a pine tree, they will tend to fall in a ring around the tree, but will bounce when they hit the ground, so the terrain impacts the distribution of the pine cones on the ground. Barnacles are essentially randomly placed on rock, but on shore-lines they are almost always found on the side of the rock facing the ocean. Generally we tend not to understand randomness very well. When we create something that we want to be random, we tend to over-emphasize filling of empty space and spreading out the information, and under emphasize the number of pseudopatterns and clumps in the data. Here’s a classroom idea. Have students go around and take pictures (or record in a journal, perhaps with a pencil drawing) of things which look random. See if they can find examples of things which are actually random, and things which are evidence of human activity. 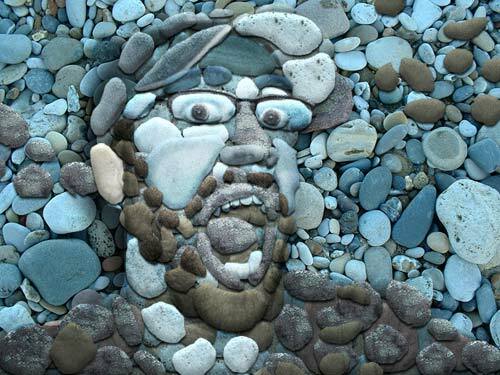 In the slideshow above, you should spot one example of a rock collection which most decidedly not random.